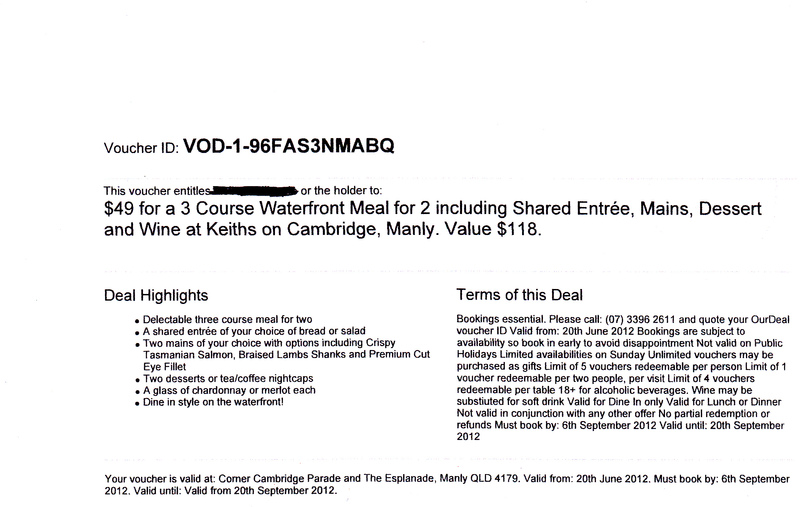 Recently, I purchased an Our Deal offer – $49 for a 3 Course Waterfront Meal for 2 including Shared Entree, Mains, Dessert and Wine at Keiths on Cambridge, Manly. Value $118. Mr MM and I are going on Saturday night. Stay tuned for photo’s of our meals and a novice taste bud review! p.s. yes I know it is past the date specified in the ‘Terms of this Deal’ but I left it a bit late to book and couldn’t get a table within the specified period so they very generously agreed to honour the deal.